If your site’s performance on Google search results pages were the Wizard of Oz, Google Search Console would be what’s behind the curtain. 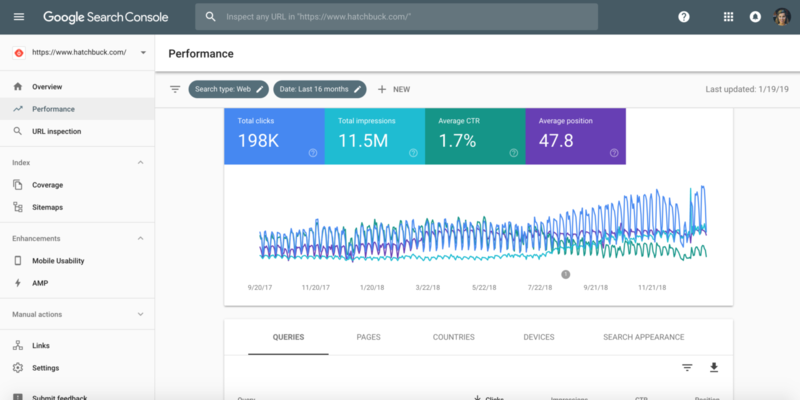 Put simply, Google Search Console is a data-driven hub for information about your website’s health, mobile friendliness, ranking search terms, and more. When used in tandem with Google Search Analytics, you’ll be able to make better decisions for your site content and search optimization. Discover which keywords you’re ranking (or not ranking) for. See which pages are getting the most clicks, which ones are turning up in top positions in search results (SERPs), which terms are generating the most impressions, and the CPC for different keywords. Identify and fix technical errors. Google Search Console notifies you when pages can’t be indexed or may have other technical issues. Make your pages searchable, faster. When you submit URLs for indexing in the URL Inspector (what used to be called “Fetch as Google”) Google crawls your new pages immediately – meaning they’ll be available in search results faster. Get a big-picture view of key site stats like your average click-through rate, impressions and average position. See which external sites are linking to yours, which of your own pages you use for internal links, and which keyphrases external sites are using in their anchor text when linking to you. With all that said, Google Search Console can be a bit complicated at first glance, which is why we’ve created this crash course for newbies. In addition, Google has recently redone the Search Console interface, so even if you’re a seasoned Search Console expert this is the perfect time to get acquainted with the new terminology and menus. To start garnering search data, you’ll need to connect your site to Google Search Console. In the new interface, click “Add Property” at the top left, and enter the full URL of your homepage. Pro tip: for the most complete picture of your site’s health and searchability, you’ll want to add each URL variation (http://www.yoursite.com, https://www.yoursite.com/, http://yoursite.com, and https://yoursite.com) as a separate property, and select one as your “preferred domain.” For the preferred domain, it’s best to pick an “https” variation, as this protocol will display the “Secure” message for site visitors. Once you’ve added a property, you’ll have to verify your ownership of that property by pasting code into your “head” tags, uploading an HTML file to your website, add a Google Analytics tracking code to your site, or use Google Tag Manager. Adding your sitemap helps Google Search Console crawl your website. It also enables Google to see which are the canonical (preferred) URLs on your website. Use “URL Inspection” to look at indexing and search appearance data for a specific URL on your site. For example, if you’re concerned that a new webpage hasn’t been indexed, entering it into this bar will confirm whether your assumption is true. Under the “Mobile Usability” tab, find actionable steps you can take to make your site more mobile-friendly – a must-have feature for any modern website. In the “Coverage” section, Google Search Console will show how many of your pages are returning crawl errors and warnings. It will provide detail on the type of error or warning for affected pages so you or your web administrator can know how serious the issue is and how to address it. If you do need to add another user (like a web admin) to your Search Console, go to “Settings” and choose “Add User.” Note that you’ll have to be a verified owner to add other users to a web property. One of the key functions of Google Search Console is to see which queries, or keywords, are leading internet users to your site. Under “Performance,” find search all search queries that have resulted in site impressions (an impression is when a page from your site showed up in search results, but wasn’t necessarily clicked). Under the “Queries” tab in the “Performance” view, you can download a CSV of all search queries and sort them by volume, CPC, competitiveness, impressions, and clicks. There are other tabs; Pages, Countries, Devices, and Search Appearance; in which you can get an idea of which pages are the most popular, where your site visitors are located, and which types of devices they’re using to access your site. If you’re trying to drive new and repeat visitors to your website (which likely applies to any business or agency), Google Search Console is an absolute must. And it’s free. It doesn’t get much better than that.